If you found this article interesting and enjoyed looking at historical documents and photos of artifacts, the Cold War Radio Museum would like to ask you to make a small donation so that we can continue and expand our work. Cold War Radio Museum In 1967, the U.S. taxpayer-funded and U.S. Government-run Voice of America (VOA) was celebrating the 25th anniversary of its founding during the early phase of America’s participation in World War II. Unlike today, in the days of the Cold War VOA not only had played a significant role in informing the world about the United States, it also helped to overcome censorship in communist-ruled countries behind the iron and bamboo curtains. Also unlike today when news and information are spread on multiple platforms, including the internet, during the Cold War shortwave and in some cases medium wave radio broadcasts were virtually the only means of transnational mass communication that could not be easily blocked by governments. Also unlike today when Americans hardly ever hear about VOA from their government or U.S. media, and if they do, it is usually in the form of calls for reforms of VOA’s parent federal agency, the Broadcasting Board of Governors (BBG), and criticism of VOA’s failures, as during recent protests in Iran, in the 1960s U.S. presidents often mentioned and praised VOA in public speeches and statements. In the Cold War years, U.S. media generally reported positively on VOA’s contributions in the struggle against communist censorship and propaganda abroad. Other U.S. taxpayer-funded transnational radio broadcasters, Radio Free Europe (RFE) and Radio Liberty (RL), also received in that period frequent positive mentions from key American political leaders and U.S. media. What these praiseful and well-deserved Cold War statements about the Voice of America always overlooked was the fact that despite its original promise to be truthful, throughout World War II VOA was controlled by U.S. Government officials and broadcasters of the Office of War Information (OWI) who were highly sympathetic to the Soviet Union and hostile toward democratic opponents of communism. They often mislead VOA audiences with propaganda designed to cover up negative news about the true nature of Soviet communism and crimes against humanity committed by the Stalinist regime. 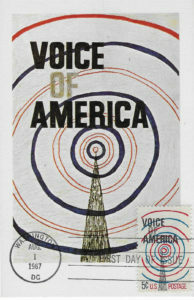 These early VOA officials and broadcasters deemed such VOA propaganda in favor of the Soviet Union necessary to win the war. They tried to help Stalin establish control over Eastern and Central Europe, which — in theirs and President Roosevelt’s view — was a prerequisite for achieving post-war peace. Their secret collusion with the Soviets and coordination of Soviet and American propaganda during World War II are not widely known and have not been studied closely by historians. Only some of VOA’s pro-Soviet propaganda activities were exposed in the early 1950s during hearings of a bipartisan congressional committee which investigated Soviet crimes, but these pro-Soviet propagandists had left VOA shortly after the end of World War II. A few wartime VOA foreign language broadcasters even went back to the Soviet block to work for communist regimes. When Senator Joseph McCarthy was conducting his embarrassing and harmful witch hunt for communists at the State Department and even at the Voice of America in the 1950s, they were all gone. A new staff of mostly strongly anti-communist journalists was hired by the State Department for VOA after the war. During the late 1940s and early 1950s, the Voice of America, which by then was under the U.S. State Department, was slowly transformed into a more truthful medium of news, other information and commentary about world affairs and the United States. In 1953, VOA was incorporated into the United States Information Agency (USIA), the newly-established public diplomacy arm of U.S. foreign policy, where it remained until the 1990s. In the late 1960s, VOA enjoyed not only wide public support in the United States but also high popularity abroad. Its staff and its programs were anti-communist and filled a critical information need in many countries lacking free press. 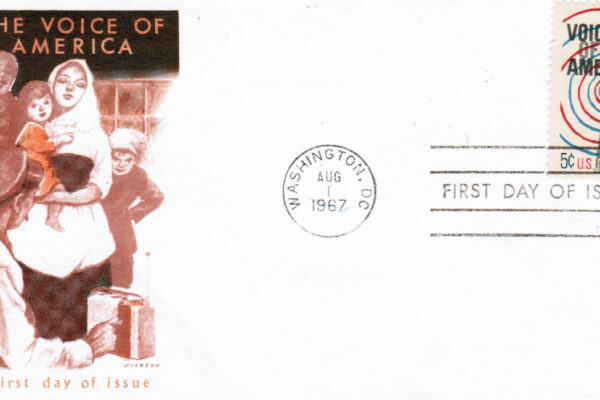 The United States Postal Service recognized the importance of VOA’s mission in support of freedom and democracy by issuing in 1967 the 5-cent Voice of America commemorative postage stamp. President Lyndon Baines Johnson signed a special statement in which he repeated VOA’s original promise to tell the truth, but without mentioning that it was not always kept during VOA’s early years. Understandably, it would not have been helpful to bring it up while VOA was fighting censorship in communist-ruled nations. Even during Johnson’s administration, VOA had experienced some censorship from the White House and the Pentagon on national security grounds with regard to reporting on the Vietnam War, but it no longer hid the truth about Soviet and Chinese communism. By then VOA broadcasters exposed human rights abuses in the so-called captive nations and countered communist propaganda. Overall, the praise President Johnson gave to VOA in 1967 was well deserved. A noteworthy passage in President Johnson’s statement was the mention of nurturing “mutual understanding” as a prerequisite to peace and freedom, as well as the use of the phrase “a descent respect for the opinions of mankind” — a slight paraphrase from the text of the introduction to the 1776 Declaration of Independence of the United States. The emphasis of the presidential statement was clearly on communicating directly with citizens of various nations in the hope of achieving better relations with them, but also with their governments. The presidential statement did not say that such direct transnational communications might lead to changes in the way communist nations were governed and does not mention communism, but it does include a reference to freedom. Communist-ruled nations were not free. The heavy lifting on countering communist propaganda and exposing the human rights abuses of communist regimes, however, was done not by the Voice of America but by Radio Free Europe and Radio Liberty, both operated outside of direct U.S. Government structures with the help of the Central Intelligence Agency (CIA) out of Munich in then West Germany. The CIA eventually had ended its involvement with RFE and RL in 1972 and their taxpayer-funding has been since then provided overtly by the U.S. Congress at the request of consecutive U.S. administrations. With the passage of time, Johnson’s statement that radio will long remain one of the most easily accessible media channels has been significantly weakened by the appearance of the internet and other digital media platforms. In the 1960s, the U.S. Government had almost a full monopoly on long-distance communications with mass audiences abroad through the use of shortwave and medium wave radio. This is no longer the case today, even though media censorship, including occasional blocking of the internet and social media, still exists in many countries around the world. Shortwave radio continues to play a role in providing information safely and directly to people of communist North Korea, Tibet, Cuba, parts of China and in a few other nations. With the abolishment of the United States Information Agency in 1999, USIA’s broadcasting functions were moved to the Broadcasting Board of Governors, and USIA’s non-broadcasting information and foreign exchanges functions were given to the newly created Under Secretary of State for Public Diplomacy and Public Affairs at the U.S. Department of State. Since then, the Voice of America has been in a slow but continuous decline in good governance, importance, relevance, and public visibility. Iranian human rights activists wrote recently in an op-ed in The Hill that the VOA Persian Service was in a “deplorable state.” These days VOA receives little public attention in the United States other than occasional criticism and bipartisan calls for urgent reforms which have not yet been answered as of early 2018. The difference between 1967 and today is striking, but new calls for reforming the Voice of America and restoring the VOA Charter, the 1976 U.S. Public Law, and for reinvigorating VOA’s pro-human rights mission continue in many quarters. 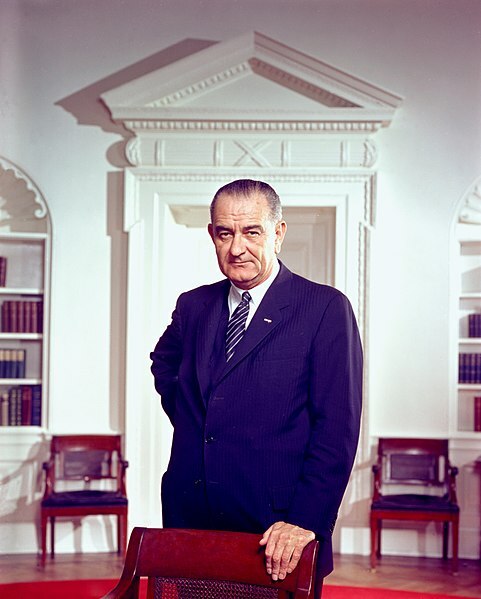 President Lyndon B. Johnson in the Oval Office, 1960s. Author: Arnold Newman, White House Press Office (WHP). 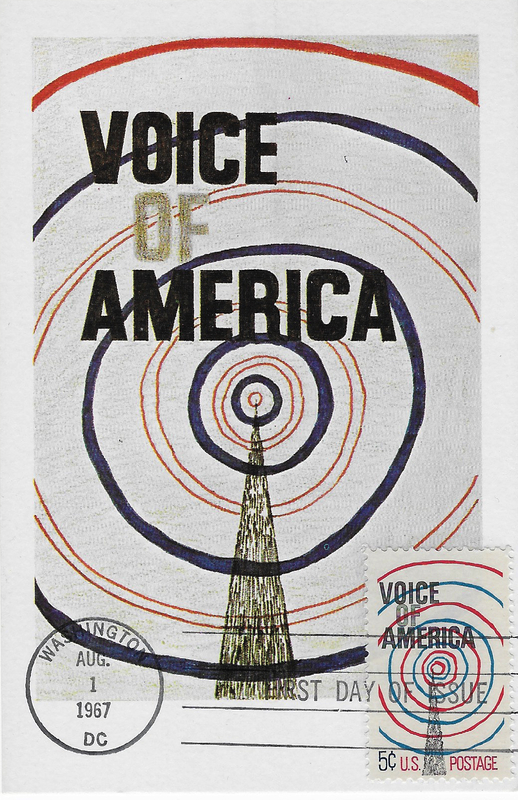 Created in the early, dark days of the Second World War, the Voice of America dedicated itself to the propagation of truth. Twenty-five years have passed, during which time the VOA has never swerved from the course of truth, to which fact its devoted audience — multiplied many times over since 1942 — is tribute. The miracles of modern mass media of communication have at last made it possible to create and nurture mutual understanding among the peoples of this planet, a prerequisite to the universal peace, freedom, and progress desired by all mankind. Radio is and will long remain one of the most easily accessible and therefore most important of the media. And it follows that the role of the United States Information Agency and specifically, Voice of America — echoing in its broadcasts the devotion of our forefathers 190 years ago to “a decent respect for the opinions of mankind” — will long contribute significantly to this country’s furtherance of better relations among the nations of the earth. 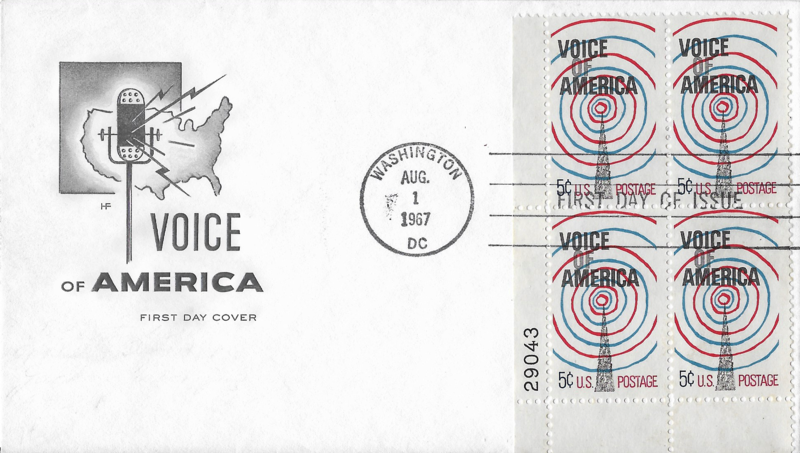 The Voice of America 25th Anniversary Stamp Ceremony was held at the VOA headquarters in Washington, DC on Tuesday, August 1, 1967. Listed on the official program for the ceremony were: Richard G. Cushing, VOA Acting Director; The Honorable Leonard H. Marks, Director of the United States Information Agency; The Honorable Frederic C. Belen, Deputy Postmaster General of the United States. The program named Georg Olden as the designer of the VOA stamp. It noted that he is the same artist who designed the Emancipation Proclamation commemorative stamp of 1963. He was described in the program as an Executive Vice President of a New York advertising agency. During World War II, Georg Olden, the grandson of a slave and the son of a Baptist preacher, was a graphic designer for the Office of Strategic Services (OSS), forerunner of the CIA. According to his Wikipedia biography article, from 1945 to 1960, Olden worked with William Golden, art director for CBS, and as such was one of the first African-Americans to work in television. A Japanese magazine, Idea, once listed him among the top fifteen designers in the United States. 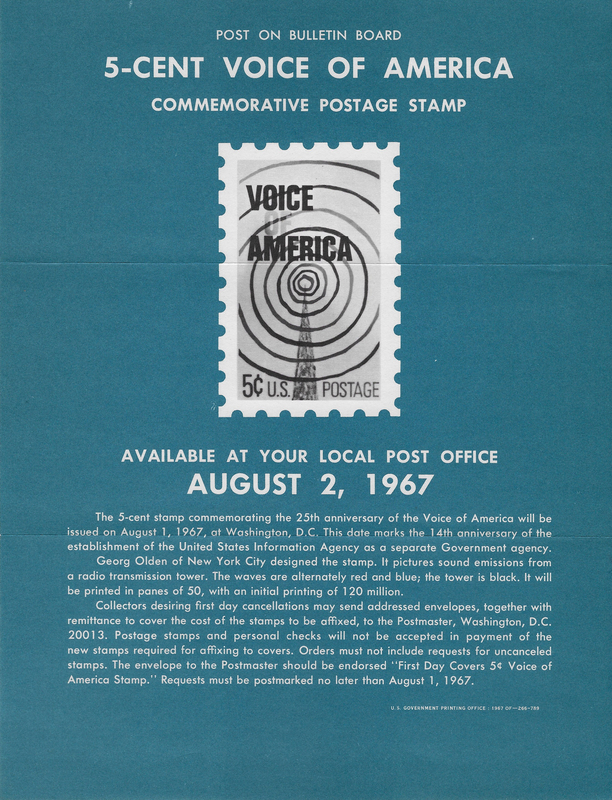 The 5-cent stamp commemorating the 25th anniversary of the Voice of America will be issued on August 1, 1967, at Washington, D.C. This date marks the 14th anniversary of the establishment of the United States Information Agency as a separate Government agency. Georg Olden of New York City designed the stamp. It pictures sound emissions from a radio transmission tower. The waves are alternately red and blue; the tower is black. It will be printed in panes of 50, with an initial printing of 920 million. Collectors desiring first day cancellations may send addressed envelopes, together with remittance to cover the cost of the stamps to be affixed, to the Postmaster, Washington, D.C. 20013. Postage stamps and personal checks will not be accepted in payment of the new stamps required for affixing to covers. Orders must not include requests for uncanceled stamps. 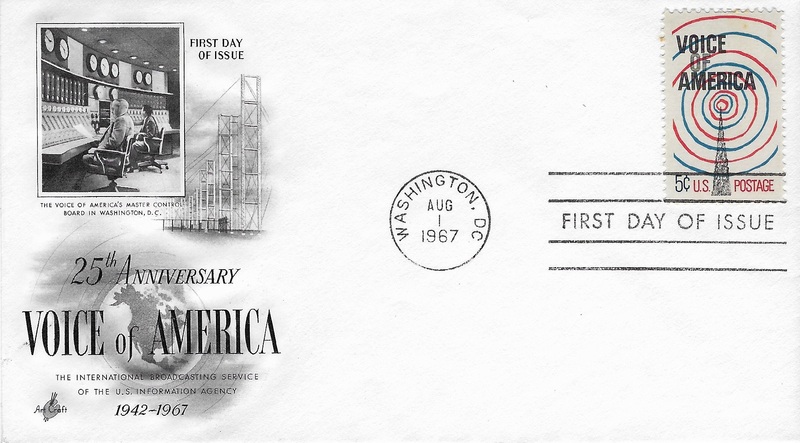 The envelope to the Postmaster should be endorsed “First Day Covers 5-Cent Voice of America Stamp.” Requests must be postmarked no later than August 1, 1967.